Vienna, famous for many things… The Danube, The Waltz, the most sensational steak… (what’s that you say?). It is commonly known that a jaunt to Vienna will largely find you on cobbled streets with road names written in “Century Gothic Bold” font and frequent nods to Sigmund Freud… what is not so commonly known is that in recent years, this place has upped its cool by 100 and with new bars, pop ups, hotels and restaurants, it is fast becoming a cosmopolitan city. 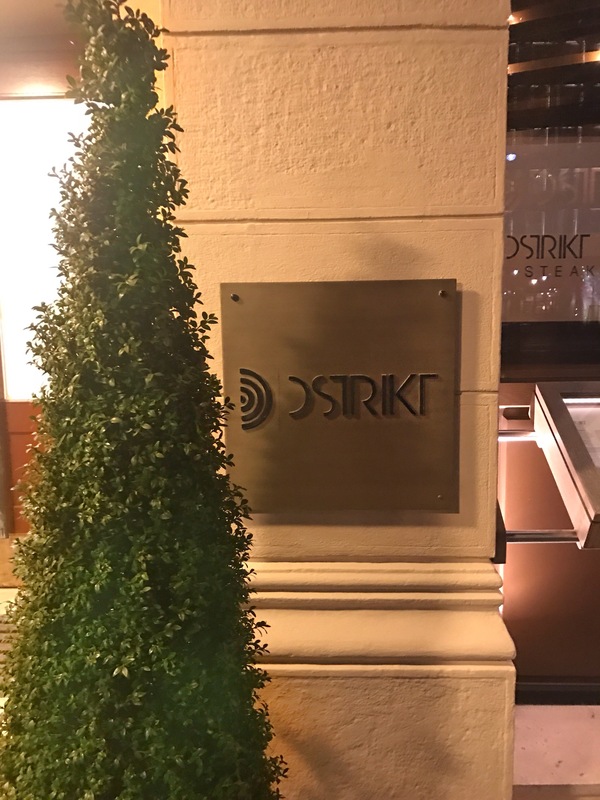 So, with this in mind, I spent my “Meat Monday” at Distrikt inside the Ritz Carlton, Vienna. Given that this was a Monday, the restaurant was PACKED. 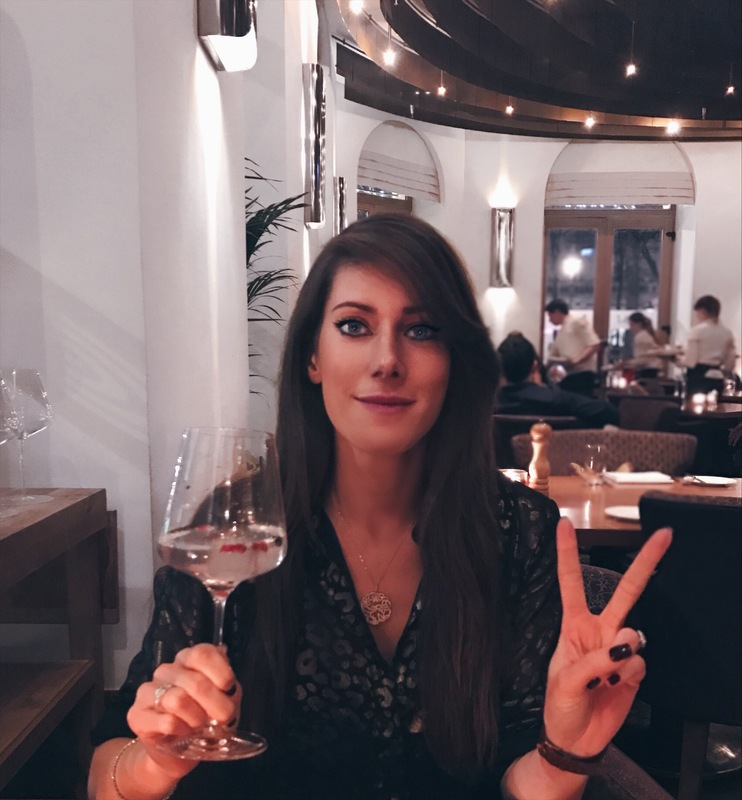 Had you told me it was a Friday night, I would have believed you and given the more quiet vibe of some of the nearby restaurants, it was like a different planet. It has a relaxed luxury with bistro style balancing bold metal and copper ceilings and refined glassware. 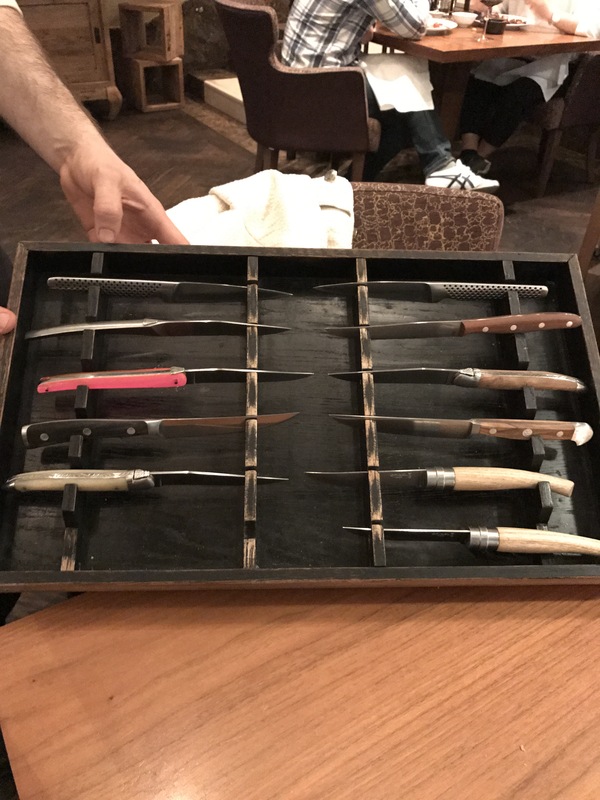 Always a fan of a little theatre (I’m such an easy sell with the little extra details) they have you select your weapon (knife) for your steak. Given the apt nature, I went for the one carved out of juniper tree wood and given the aesthetics, my guest opted for the bright pink one. We started with Stuffed avocados and Calamari, which was surprisingly light which is a good thing, given what was awaiting us for our main. The squid was super soft and well seasoned. 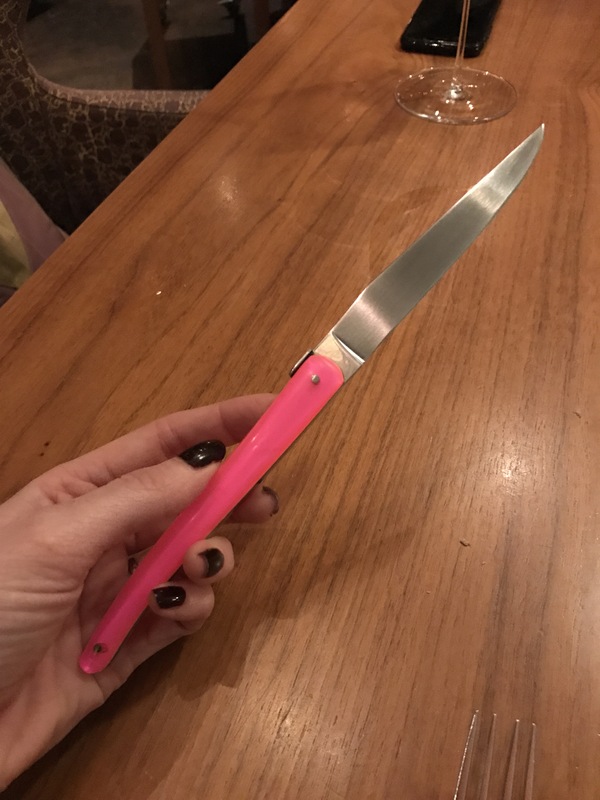 Now, I have to admit now that I am a self proclaimed “refined carnivore” and so without putting too fine a point on it… I am more than a little picky with my steak. It is one of those things that I believe needs to be perfect (and medium rare but nothing more). 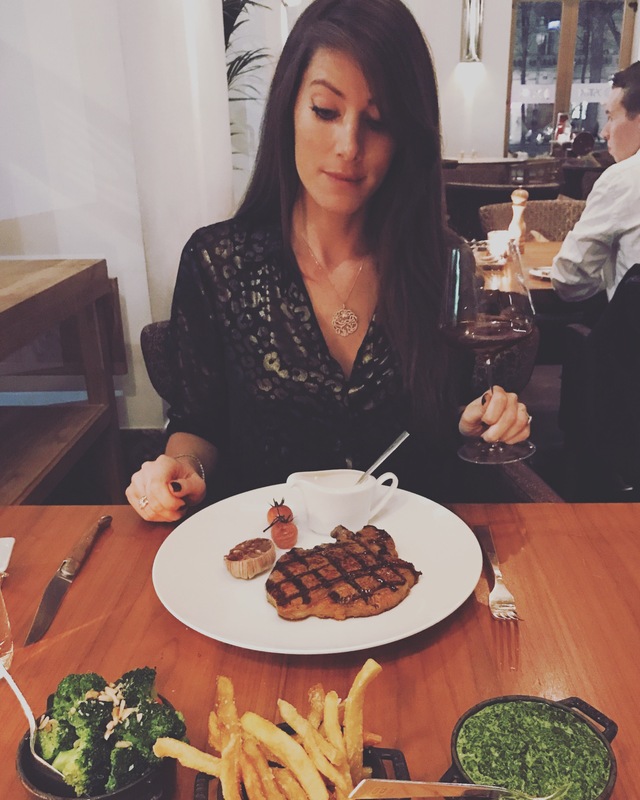 I opted for the Rib-eye for 2 reasons… Firstly because unless I’m “sharing” a chateauxbriand, I always have a rib eye and secondly because it is….. The Best cut. I’ve said it, raised eyebrows all round. Sirloin isn’t marbled enough, hanger is always underwhelming and don’t even talk to me about fillet…. Fillet steak is the equivalent of ordering plain toast and no eggs at brunch. It’s a classic but actually reasonably tasteless in comparison to your other options. It was cooked to the perfect temperature and had enough Bearnaise to smother it. Genuinely an excellent steak from excellent meat. 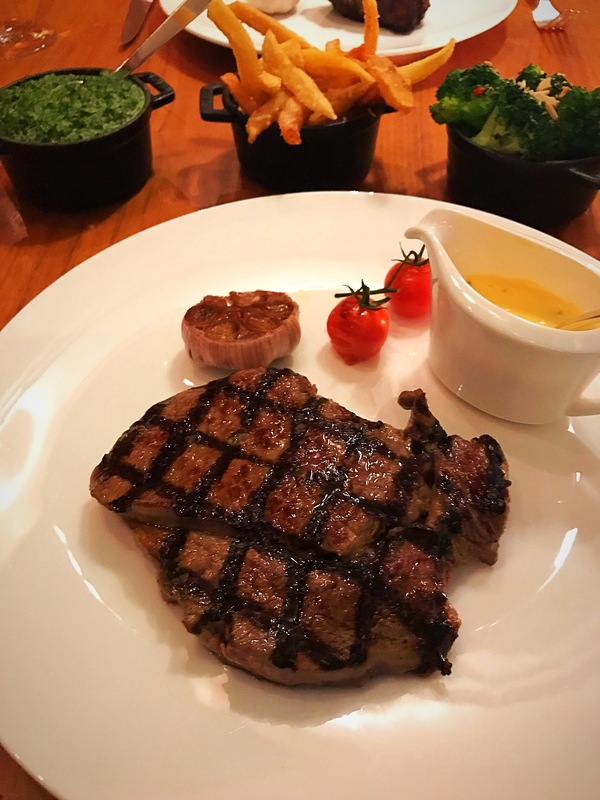 My guest had the fillet and while I harp on about filet not being my ideal, for those who don’t like fat or marbling, but do like steak, this is your cut. She loved it. For the sides, we had them all. Because when you’re eating great steak, the worst thing you can do is say “I’ll just have a salad”. We had Creamed Spinach, Broccoli, Vegetables and…. wait…. Triple cooked truffle chips. If you skip these, you’re only cheating yourself my friend. So here is the thing… I love crumble and crumble loves me. It is the perfect desert and I always leave the meal feeling fulfilled and happy rather than heavy and guilty. The snag is that unfortunately for everyone, my mums crumble already holds the top spot. Why? 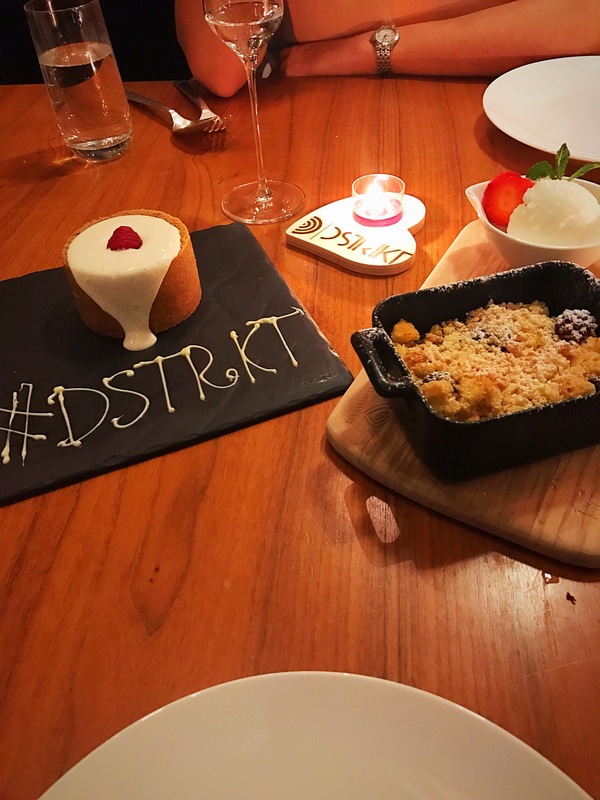 The ratios… When I say, “Yes, I will have the apple crumble please” what I actually mean is… “I only want the crumble but if there is some thin apple at the bottom to cushion my crumble, I’m fine with that. My guest loved the crumble so much she ate half of the dish… When I say guest, I mean me and when I say half I mean all. They also brought out a Vanilla cheesecake, masquerading as a cherry bakewell (for the Brits). This was DELICIOUS and had a ridiculously good gooey vanilla cream on top. Not as heavy as a usual cheesecake but just as rich. Frankly the fact that we left the plate was a surprise. Given how full we were from our steaks, this was a pretty surprising attack on dessert by us. 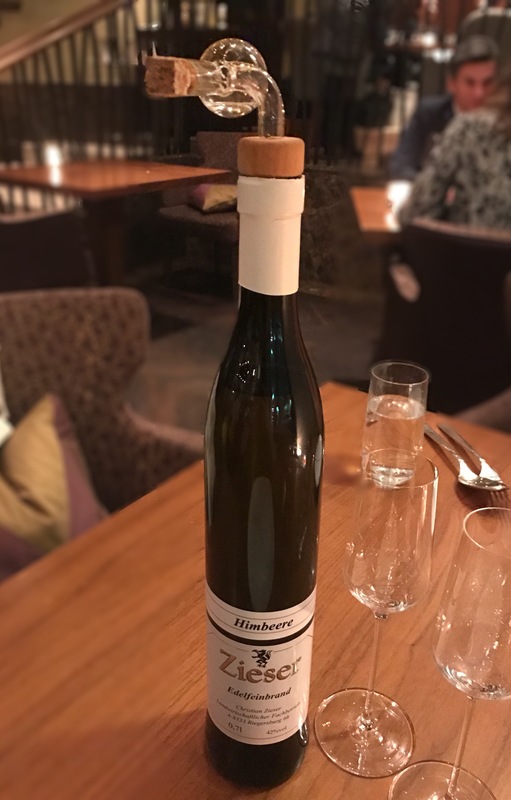 We were recommended to try several (I know) but this one particularly stood out as teccomended by their excellent sommelier. 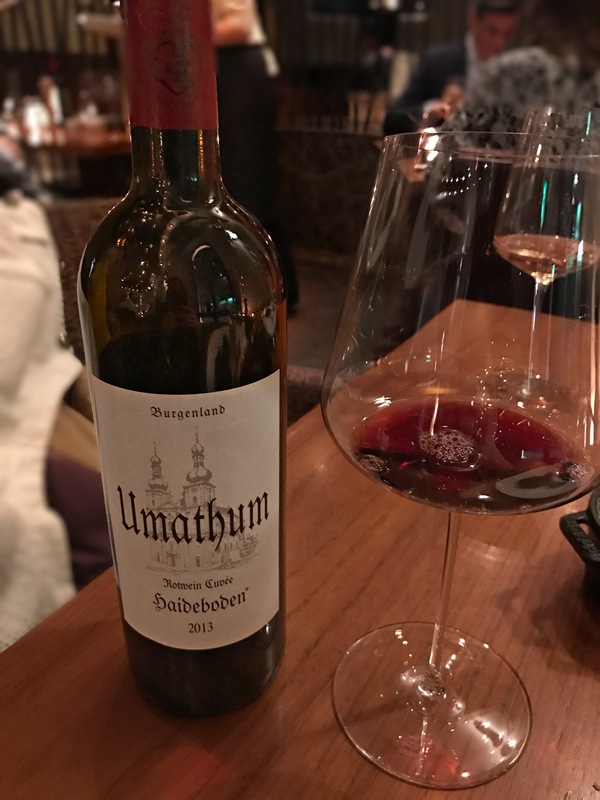 Umathum from Austria. This was finally topped off with a raspberry schnapps. I told them that one too many teenage schnapps’ has left me feeling about it the way most do about Ouzo… Not good. However, he assured me that this was Vianese schnapps and came in a range of flavours of which I chose raspberry…. Holy burning ostofagus was this strong. I was beaten about half way through but definitely worth trying. The coolest thing about it was the bottle that was a little more breaking bad than it was post dinner liquor and gave a bit of theatre to the drink, (which I always love). A special mention to our server Florian who was every inch the ideal waitor and so charming and genuinely cared about the produce. Above all else, the food is great and the service is excellent. 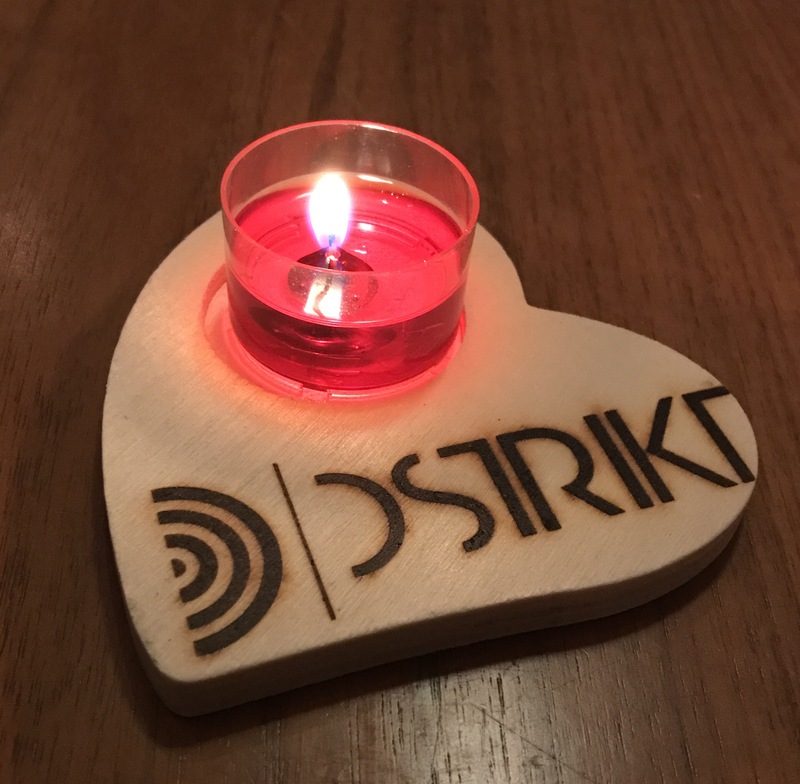 You leave feeling really “taken care of”.